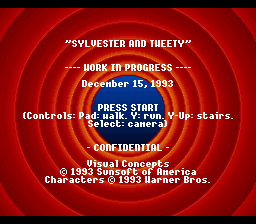 Sylvester and Tweety was a game in development by Visual Concepts and Sunsoft. This is another rom release in partnership with Lost Levels. Sylvester and Tweety was one of several games based on Warner Brother cartoons by Sunsoft. It eventually met its end when Sunsoft went bankrupt in early 1995. Acclaim bought the rights to distribute some of their games (like Porky Pig's Haunted Holiday), but this game perhaps was not in good enough shape for them to consider releasing. This second demo dates to December 15, 1993. 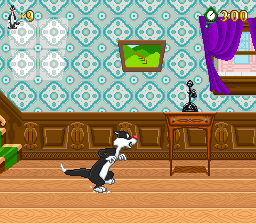 It features a single room where you control Sylvester. 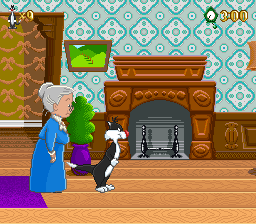 Granny and Tweety wander around the level (with Tweety running if you get too close), though you cannot directly interact with them. There is not much you can do except run around, and go up and down stairs. According to Rene Boutin, a producer at Sunsoft, a one level demo was shown at CES or E3 around 1994 and 1995. 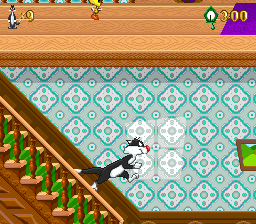 In the demo, you controlled Sylvester, so it perhaps was something similar to demo #2. The game was advertised in a Sunsoft advertisement in 1995, though it is unknown how close it was to completion. When Sunsoft of America went under, most games that were near completion were sold to Acclaim, so it is unlikely this game was ready for release.